Badge ribbons are a great marketing, brand recognition and promotional tool. Name tags with ribbons can advertise a sale, event or brand. Attaching ribbons to name tags and badge holders at a conference is an excellent way to identify and recognize the different roles of attendees. Conference ribbons may include information that identifies speakers, staff or a variety of additional roles, providing a valuable networking tool. Fastener options for name tag ribbons include double-sided tape or pins. Ribbons are available with stock titles, or personalize with custom text and a logo. Imprinted Ribbons: Minimum quantity: 25 ribbons, mix and match titles and ribbon colors to reach minimum order. Select from 35 ribbon colors, a large selection of stock titles, or your custom text with an optional logo. Full Color Ribbons: Minimum quantity: 100 ribbons. Customize the ribbons with text in your choice of fonts and the ability to print ribbons that have multiple colors, including gradients and blends. Add multiple ribbons to a badge holder. Personalize your conference badge ribbons by having your custom phrase printed on the ribbon of your choice. If you would like, you may include a company or event logo. The possibilities are almost endless. Imprinted Ribbons: The ribbon text and/or logo will be imprinted onto the surface of your ribbon using your selection of a metallic or single color foil. 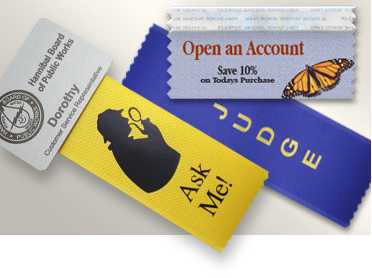 Choose from 1.625 inch and 2 inch wide badge ribbon; custom lengths are available. Minimum order: 25 ribbons, mix and match titles. Full Color Ribbons: Ribbons will be printed on white ribbon; the background of the ribbon may bleed off the edges, and the image may contain gradients, blends and even photographic artwork. These ribbons work very well as handouts at trade shows, conventions and other events. They are also perfect for promoting a sale or event. Minimum order: 100 ribbons (all ribbons will be the same).